Reply [almost certainly to Dr Hall] concerning 'Miss Hearsey Fullarton', with informal advice on regimen and also mentioning a Mr Waugh. 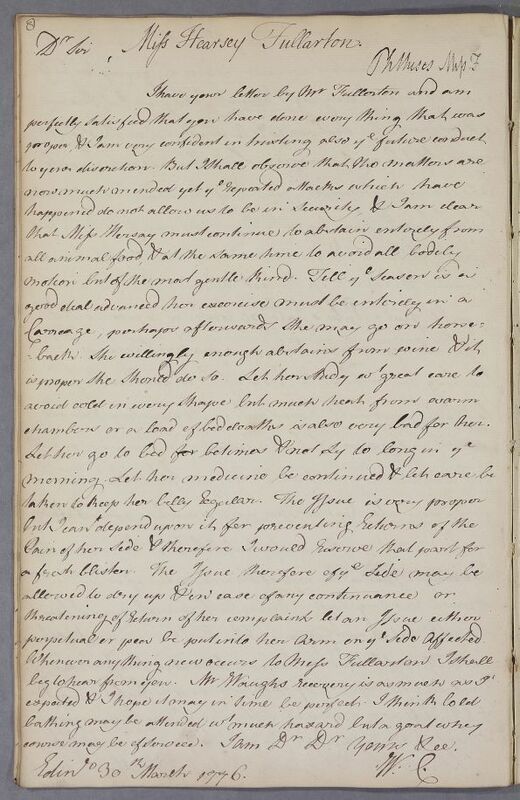 Summary Reply [almost certainly to Dr Hall] concerning 'Miss Hearsey Fullarton', with informal advice on regimen and also mentioning a Mr Waugh. Case of Mr Waugh only known from an aside remarking on his recovery and advising cold bathing and goat whey. chambers or a load of bed cloaths is also very bad for her. purpetual or pea be put into her arm on the side affected. course may be of service. I am Dear Dr Yours &cc. purpetual or pea be put into her arm on ye side affected. I am Dr Dr Yours &cc.